This is a very useful way of storing all your little goodies, or even to tidy up your study or garage. Instead of buying something new that increases your carbon footprint, rather try to upcycle what you already have lying around the house. Let's all Upcycle and give junk a second chance. 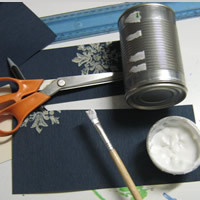 Our easy step by step instructions will show you how to make your own recycled storage tins. 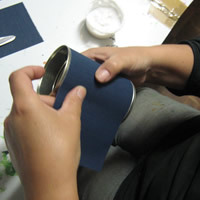 Wash your tin and remove the label carefully, we want to use the label as a template. 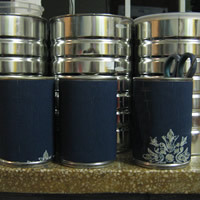 Measure the label you just removed to get the sizing, or if the label was torn too much, measure the tin. Measure your wallpaper, mark it on the cutting lines and cut it out. 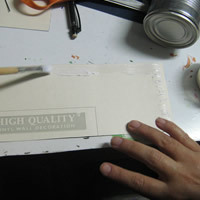 Apply modge podge or jewel glue along the entire edge of the wallpaper "label" you have just cut out. 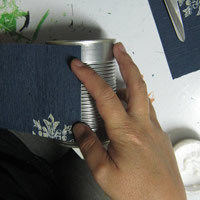 Stick and hold down the one side of the label, and then gently fold it around the tin. The wallpaper may stretch a bit while doing this, so try to handle it as little as possible. 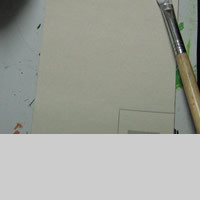 Hold the label in place for a minute or two, and, voila!